As you may know, I drive past a church billboard every day on my way to work, which is updated ever month with a new slogan and picture. These billboards are coming from Outreach Media, whom I've mentioned several times in my blog over the past months. And as usual, this month they are taking a contemporary concept and using it to espouse the gospel. And what a more current topic than the soccer (football, whatever you want to call it)? Now this is by no means the most absurd billboard they have posted on the side of the Clifton Hill Presbyterian Church, and it is something I have been wondering about. 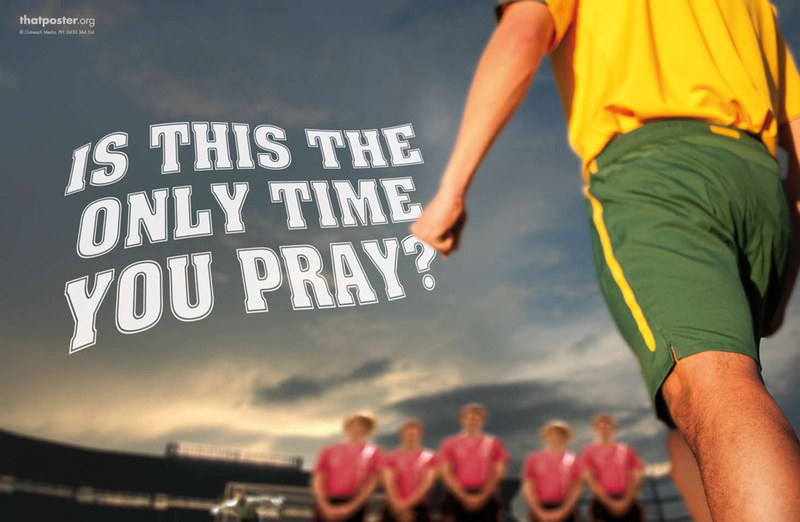 When 2 sides are playing a sport, and they both pray to win, who does god listen to? The side that wins will say that because they prayed, they won. The losing side probably won't mention it. "When he calls to me, I will answer him; I will be with him in trouble; I will rescue him and honour him"
The idea being that Jesus and God listen to everyone, all the time, not just in times of need. But the way it reads it is as though people who pray will get their wishes granted, and, well, if they don't it can't have been part of God's plan. "This is an amazing promise. The God who created the universe is inviting each and every one of us to talk and learn from Him one-on-one. He wants us to bring our requests, thanks, hurts and anxieties to Him without fear. He wants to build a deep and loving relationship with us. He wants to support us through the toughest of times and the best of times." And it goes on to say how God wants to have a personal relationship with each of us, so long as we believe in him, and pray to him for guidance, forgiveness and mercy, and to not cast us into the pits of Hell. So if we don't pray to God, we don't offer ourselves as servants and we deny God's existence, God is not with us, even though God loves us all? And what about all the other of God's children, the ones he created into a Muslim or Hindu family? Are they also not saved? Too many questions for just a mini blog. The only one that wants to have a "deep relationship" with us is the church, for without the support of the people, the church dies. Simple as that. What are your thoughts on this billboard? They are running a simulacrum of a personal god in their own minds. It doesn't have to be real, but they interact with their idea of a god as if it were real. It's a very interesting concept that I have been learning about recently. LOL, I think you should get another billboard that says "Adults don;t need imaginary friends, and definitely not imaginary parents. They're adults."